Local Spots: Currently working in Shanghai, China at the moment so I'm tripping as much as I can around Asia to explore as much as I can while I'm here and surf some spots that I otherwise wouldn't have. Got some good waves in the South of China recently. 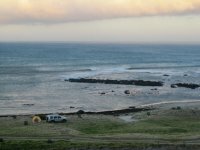 Favourites Spots: I loving being home back in New Zealand in the far north of the North Island camping around the reef with friends and family at Shippies. My Best Ever Session: I'm old, been surfing for about 26 years now...I've got to many great sessions, that's why I keep going back. Biggest Fear or Wipe out: To many... who wants to think about that. Most Recent Contest: Got last in an Air Guitar Competition at a pub. Does that count? 1198 Guests have visited this profile..